The Dead Past forms the first part of Sir Edmund’s fictionalised memoirs, and was completed only some months before his death in 1944. Like an opium dream, it blends truth and fantasy to bring alive a youth spent in the company of the leading personalities of the fin de siècle. Those featured include Oscar Wilde, Lord Alfred Douglas, Walter Pater, Paul Verlaine, Lord Rosebery, and the courtesan La Belle Otéro, some of whom are described as his lovers. The chapter on Wilde reads like a revenge for past snubs. Sir Edmund’s other volume of memoirs, Décadence Mandchoue, details his later life in China, describing real or imagined affairs with nobles and commoners, and also with the Empress Dowager Cixi (Tz’u Hsi). It was first published in 2011 by Earnshaw Books, and was written prior to The Dead Past. Despite The Dead Past being completed in Peking in 1943, it has only been available to readers in typescript form, upon application to one of the four institutions that hold copies. This is despite its continued referencing by scholars. The aim of Volupté is to enhance and broaden the scope of Decadence studies and stimulate discussion in relation to literary Decadence and other forms of discourse, including Philosophy, Psychology, Religion, and Science. Peer-reviewed essays and book reviews will be published alongside new translations, poetry, short fiction, and visual art. Based at Goldsmiths, University of London, Volupté is dedicated to promoting cutting-edge work by creative writers and artists and publishing the best research on Decadence by early career and established scholars. For details about how to submit proposals for publication, see Guidelines. To contact the Editors, please email volupte@gold.ac.uk. Volupté is a unique SquareSpace website hosted by University of London Computing Centre (ULCC) using the Open Journals System (OJS). The ‘Jewelled Tortoise’, named after J. K. Huysmans’s iconic image of Decadent taste in A Rebours (1884), is a series founded by Stefano Evangelista and Catherine Maxwell in 2014 and dedicated to Aesthetic and Decadent literature. Its scholarly editions, complete with critical introductions and accompanying materials, aim to make available to students and scholars alike works of literature and criticism which embody the intellectual daring, formal innovation, and cultural diversity of the British and European fin de siècle. Joseph T. Acquisto has announced the publication of his book Proust, Music, and Meaning: Theories and Practices of Listening in the Recherche. The Latchkey: A Journal of New Woman Studies is pleased to announce the launch of its latest issue. Take a minute to scroll through our Table of Contents; click on the link included below to go directly to the issue. The biography is the first, and possible only because I was able to track down and receive the help of Wratislaw’s grandchildren – who kindly allowed me access to the unpublished remainder of the memoir from which Theodore’s oft-cited reminiscences of Wilde was taken and published in the 1970s – other family members, and material in private collections (most notably Barry Humphries’ unrivalled collection of ‘Wratislaviana’). 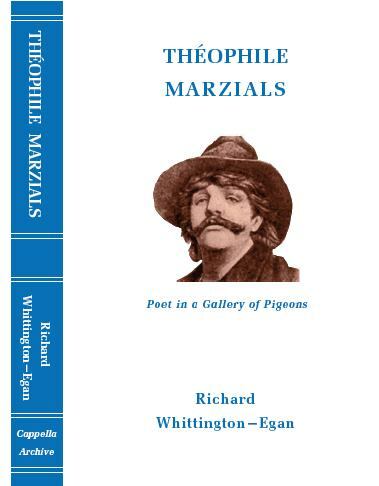 I would go as far as to say that it completely reassesses Wratislaw’s life, and will necessitate a similar reassessment of his poetic legacy – but then I would, wouldn’t I? Edited by Amanda Gagel (Editor) & Sophie Geoffroy (Associate Editor). 658 pp. Dr. Anne Manuel at the Vernon Lee Archive at Somerville College, Oxford;Dr. Corinna Jäger-Trees at the Bern Literary Archive; Alyson Price at the British Institute in Florence; Laura Desideri at the Gabinetto Vieusseux; Fiorella Superbi at Villa I Tatti; The British Library; The Bodleian Library, Oxford. This should be of particular interest to scholars not familiar with the French language as Mauclair’s novel provides a keyhole picture of the cultural, social and political essence of the artistic milieu of nineteenth century Paris. Many of Mauclair’s contemporaries such as Stéphane Mallarmé, Auguste Rodin, Claude Debussy, Whistler are represented under disguise. 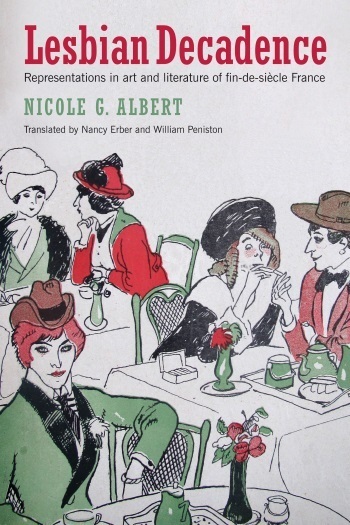 Lesbian Decadence: Representations in Art and Literature in Fin-de-Siècle France by Nicole G. Albert; translated by Nancy Erber and William Peniston. In 1857 the French poet Charles Baudelaire, who was fascinated by lesbianism, created a scandal with Les Fleurs du Mal [The Flowers of Evil]. This collection was originally entitled “The Lesbians” and described women as “femmes damnées,” with “disordered souls” suffering in a hypocritical world. Then twenty years later, lesbians in Paris dared to flaunt themselves in that extraordinarily creative period at the turn of the 19th and 20th centuries which became known as the Belle Époque. Lesbian Decadence combines literary, artistic, and historical analysis of sources from the mainstream to the rare, from scholarly studies to popular culture. The English translation provides a core reference/text for those interested in the Decadent movement, literary history, French history, and social history. It is well suited for courses in gender studies, women’s studies, LGBT history, and lesbianism in literature, history, and art. Nancy Erber is professor emerita of linguistics and modern languages at LaGuardia Community College, City University of New York. An expert in fin-de-siècle literature, she edited, along with George Robb, Disorder in the Court: Trials and Sexual Conflict at the Turn of the Century. William A. Peniston is the librarian and archivist at the Newark Museum, as well as a French historian with a doctoral degree from the University of Rochester. He is the author of Pederasts and Others: Urban Culture and Sexual Identity in Nineteenth Century Paris. Nancy Erber and William A. Peniston co-edited and co-translated Queer Lives: Men’s Autobiographies from Nineteenth-Century France and Bougres de vies: huit homosexuels du XIXe se racontent. The Genge Press announces the publication in new English translations of two plays by Edmond Rostand. For the Press Release, please click here. Pierre Michel announces the publication of no. 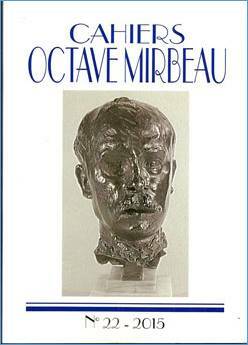 22 of the remarkable Cahiers Octave Mirbeau ( 304 pp., abundantly illustrated). Click here for the Table of Contents. Volume 2 of the Pierre Louÿs Correspondance croisée, covering the years 1899-1905 and edited by Gordon Millan, was published by Honoré Champion on Friday 27 th March. The first anthology of Decadent short stories reflecting a variety of fin de siècle themes. This wide-ranging anthology showcases for the first time the short story as the most attractive genre for British writers who experimented with Decadent themes and styles. From familiar writers such as Ernest Dowson, Arthur Symons and Oscar Wilde to less well known writers such as Charles Ricketts, Victoria Cross and Ella D’Arcy, the 36 stories demonstrate ideas of class, gender, sexuality, and science as well as the Gothic, social satire, Symbolist fantasy, fairy tale, Naturalism/Realism, Impressionism, erotica, and the scientific romance. The selections represent the important role that magazine culture played in the unprecedented explosion of the Decadent short story in the 1890s. A full introductory essay sets the scene, while an introduction and endnotes for each story and explanatory material at the end of the book – including a chronologically arranged and annotated list of Aesthetic and Decadent stories and a select bibliography – make this anthology stand out. Miroslaw Aleksander Miernik: The Literary Images of Frederick Rolfe. Frankfurt am Main, Berlin, Bern, Bruxelles, New York, Oxford, Wien Peter Lang 2015. 214 pp. Drawing on theories of biography and autobiography, including the works of Philippe Lejeune, Michel Foucault, and Philip Roth, Rolfe, Rose, Corvo, Crabbe attempts to tackle the issue of Frederick Rolfe’s image. Like many other authors, Rolfe (1860-1913), also known as Baron Corvo, wanted to influence the way others see him through his works. However, the image he wanted to project was skewed by A.J.A. Symons’ fascinating, yet inaccurate, biography, The Quest for Corvo, which popularized a strongly autobiographical approach to his work. Analysing the issue, this book takes into consideration his biographies, his self-fashioning in his letters, and his novels, particularly focusing on the characters who were heavily inspired by his own experiences, such as Nicholas Crabbe and George Arthur Rose. Mirosław Aleksander Miernik is an Associate Professor at the Institute of English Studies at the University of Warsaw. His research interests include 20th and 21st century American culture, Subcultural studies, Postmodern American literature, and British literature of the early 20th century. 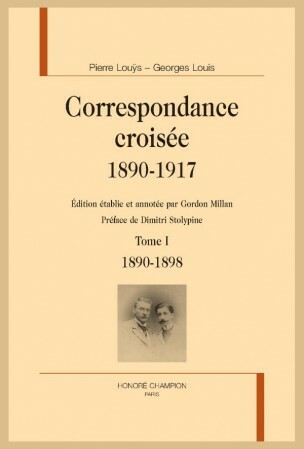 Gordon Millan : Correspondance croisée Pierre Louÿs-Georges Louis 1870-1917, tome 1 1890-1898, éditon établie et annotée par Gordon Millan, Honoré Champion, collection “Bibliothèque des Correspondances, Mémoires et Journaux”, 2015. EAN13 : 9782745327482. Vols 2, 3 and 4 will appear at three monthly intervals. Volume 4, scheduled for publication in September 2015, contains a general index of all 4 volumes. Pierre Louÿs a entretenu des correspondances avec de nombreuses personnalités des lettres et des arts. Au fil des années, ces correspondances ont commencé à voir le jour: celles publiées récemment avec Paul Valéry, André Gide, et son beau-père José-Maria de Heredia complètent d’autres déjà connues avec Claude Debussy, Frédéric Lachèvre, Jean de Tinan, Curnonsky, etc. Aucune de ces correspondances, pour intéressantes qu’elles soient, n’égale en valeur tant par son contenu que par sa régularité celle que Pierre Louÿs entretint presque chaque jour et parfois plusieurs fois par jour pendant plus d’un quart de siècle avec son demi-frère, Georges Louis. Après la dispersion des papiers de Louÿs, on a longtemps cru cette correspondance irrémédiablement perdue. Il n’en est rien. Réunie aujourd’hui après quarante années de recherches, cette correspondance croisée nous permet de suivre un dialogue passionnant entre un écrivain qui vivait au coeur des cercles littéraires et artistiques de Paris et un grand fonctionnaire de l’État qui occupa au Caire, à Paris et enfin à Saint-Pétersbourg les postes diplomatiques les plus importants de son époque. Témoignage sur une exceptionnelle relation affective, ces lettres nous fournissent d’intéressants commentaires sur les amitiés littéraires et artistiques de Louÿs avec Mallarmé, Heredia, Régnier, Gide, Valéry, Debussy, Oscar Wilde, pour ne citer qu’eux. Pour leur part, les lettres de Georges Louis, subtilement nuancées, pleines de conseils et d’encouragements et, le cas échéant, de critiques parfois brutales, donnent à cet échange épistolaire une importante dimension historique et politique. Les grands événements de la fin du XIXe siècle défilent devant nos yeux avec de savoureux commentaires souvent très informés: le scandale de Panama, le procès d’Oscar Wilde, l’affaire Dreyfus, Fachoda, la crise marocaine, la crise des Balkans et la catastrophique Première Guerre mondiale. Il s’agit en fin de compte d’un témoignage unique de deux spectateurs privilégiés qui jettent un regard souvent amusé mais toujours éclairé sur un monde qui n’existe plus. Spécialiste de la littérature française de la fin du XIXe siècle, Gordon Millan est l’auteur d’une des toutes premières études sur Pierre Louÿs : Pierre Louÿs ou le culte de l’amitié, (éditions Pandora, 1979). Il a également publié de nombreux ouvrages sur Stéphane Mallarmé, dont une biographie et plusieurs éditions critiques. Il prépare actuellement un ouvrage sur l’amitié Pierre Louÿs — Claude Debussy.